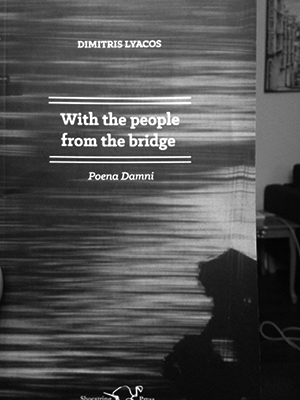 Dimitris Lyacos' With the people from the bridge: Poena Damni is the second instalment of a long and brutal sequence of avant-garde poetry. Set among the homeless who have formed a settlement under a bridge (their discourses are constantly interrupted by trains and traffic) this story alternates between apocalyptic dystopia, poetic religiosity, and brutal secular realism. When faith and desperation meet the ending is often mired in blood and misery. In this long sequence a mad robber/saint leads a chorus of ageless, ugly women in worship of an unknowable God. With the people… was translated from the Greek by Shorsha Sullivan and he did such a complete and convincing job of it that the poems read as though they were originally written in the English tongue. There isn't any of the odd, awful awkwardness so often present in second-rate translations, and that's a rare and beautiful thing. In the prose-poetry introduction, the Narrator rips pages from a tattered copy of a Bible as he declaims his dark prophecy. He’s marked out from the other mortals by 'A scar like a word on his chest, from his neck downwards. Sits down, takes two pieces of wood, hammers, he made a cross. Sticks it in the mud.' A madman, marked by the word of God, made visible in his flesh. Lyacos uses images to make a myth out of homelessness and at the same time reveal the brutal horror of that state. A half-burned twig curling up a little. Hush. Listen now. Did you hear? They have come. They will sit side by side. You will bring them something to drink. This year they have come from further away. Let us sit all together. Hairs stuck on her skin. She had sweated a lot. I was holding her in my arms. arrested, Los Angeles police said. The interesting thing is that, after so long spent in this mad, desperate company the sane boundaries of what we think of as the 'real' world begin to darkle and shift. Perhaps the dead can rise again. Perhaps the world is ending only to begin afresh. This is Lyacos' great gift. Shorsha Sullivan's great skill is that he was able to translate it so seamlessly, so well, that his voice disappeared into the margins.